Undated spiral bound 12 month baby calendar with month on a page format, begins at birth, matte stock, 11 1/2" x 20 1/4" opened and 11 1/2" x 9 1/4" closed. 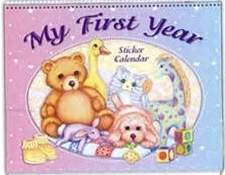 No other year is as eventful or memorable as a baby's first year This non-dated calendar is the ideal place to record not only important information but also all fun things babies do daily. Each page has lots of room so you can use it as a scrapbook as well as a handy calendar. If you are a professional in the baby industry and wish to purchase this calendar in bulk with your logo / name imprint information, contact us.